The Wizard of Crescent Moon Mountain is firmly rooted within the high fantasy genre, telling the tale of the wizard Greybeard and little elf Beezle who set off on an adventure after a magical weapon proves to have a distinct life of it's own. The novel draws heavily from Lord of the Rings with nods to other fantasy series such as Harry Potter and I must admit this does leave the reader with a feeling that its all been done before. I think part of this is due to the very familiar sounding names such as Greybeard, Gandralf, Finn and Perrywinkle however the story itself provokes a sense of Déjà vu too. This is however clearly intentional, its not hiding its roots but very honest about where the inspiration has come from and should be enjoyed as such. So we've got the usual elves, dwarves, goblins and bearded ancient magicians along with a quest that see's a band of adventures set off on a perilous journey to save the world from imminent doom. It's very much a traditional tale and one that has a distinct child friendly, young adult edge with uncomplicated narrative and a positive, light-hearted feeling that extrudes from the pages and offers a comfortable, relaxing read. The book is written in the present tense from the third person and this approach does take a little getting used to despite the friendly style. I must admit that I am not the biggest fan of present tense narrative however this book did win me over and I found it did work well with the subject matter, becoming the difference the book needed to set itself apart. I liked the many colourful characters, yes they are built on well defined fantasy tropes with agile elves and taciturn dwarves but even so they work well within the story and the interplay between them is often very effective including a pervasive humorous dynamic with a gentle humour which extends to much of the novel - at times providing a self-depreciating reflection which reminds the reader not to take things too seriously. The plot itself does take a little time to get going but does build pace towards the end, the climax of the story is handled in a very effective manner and worth the wait. 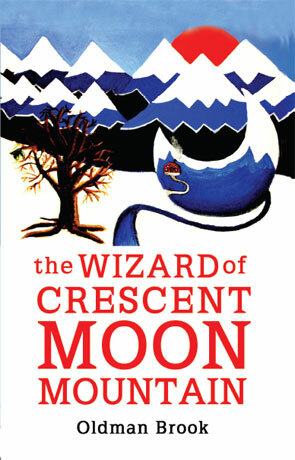 Overall The Wizard of Crescent Moon Mountain is an enjoyable story, a traditional young adult fantasy tale full of simple, uncomplicated pleasures. Written on 1st August 2012 by Ant.